Nov. 15, is now marked as a historical day, BTS performed at Jimmy Kimmel. BTS, also known as Bangtan Boys, is the first K-pop group to perform on Jimmy Kimmel. The Jimmy Kimmel Studios are located across the street from Hollywood High School. BTS is big in Korea but also has a huge international following. On Twitter, they have 10 million followers and on Instagram, they have 6.5 million followers. The group consists of the leader Kim Namjoon, Kim Seokjin, Min Yoongi, Jung Hoseok, Park Jimin, Kim Taehyung, and Jeon Jungkook. Jimmy Kimmel is one of the many American shows that BTS will appear. Once the news came out tickets sold out quickly. International fans were happy to hear that BTS will be performing in the U.S. since it is very rare that a kpop acts come to America. Many fans camped outside of the studios of Jimmy Kimmel to get the best seats since it was first-come-first-serve. Their sound check began at 4:30 pm, there was at least 200 fans waiting outside. Fans risked their lives by climbing on fences and cars. 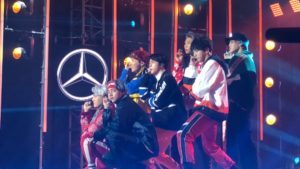 Fans were on ladders, fences, and on top of cars just to catch a glimpse of BTS. During soundcheck, BTS performed Mic Drop, Save Me, Fire, Blood Sweat and Tears, and Go Go. Fans were chanting so loud students from Hollywood heard. Gina Song, a SAS junior, expressed her love by saying “I’m finally breathing the same air as my oppas.” Their actual performance began 5:45 pm. The episode will air on Nov. 29 on ABC.